Meets all ADA requirements for dimension, spacing, dot height and shape of Braille lettering. Meets all ANSI A117.1-1998 standards. Durable and weatherproof in all environments. The photo above shows the contrast between Raster™ Braille (the top image) and regular engraving (the bottom image). Regular engraving gives the Braille a harsher visual impact. 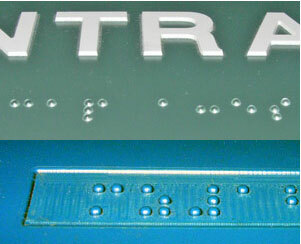 Raster™ Braille is a method of inserting a machined bead (Raster™) into a hole. It's held in place by a piece of acrylic fitted tightly to the Raster™. Raster™ Braille signs have a very clean look compared to regular engraved Braille signs, and the clear Braille beads blend right in with the color of the sign. 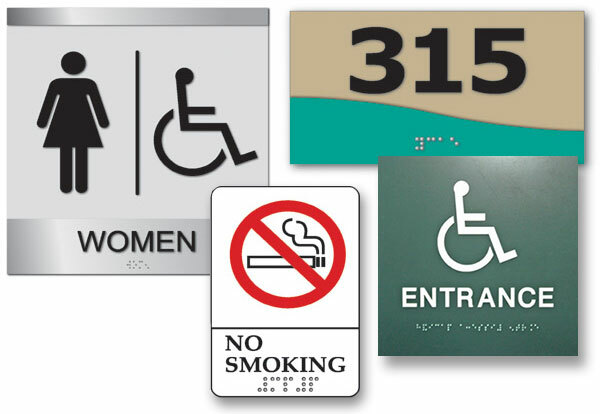 For detailed information about the ADA's signage requirements, see the ADA Accessibility Guidelines. To place an order or request an estimate, give us a call at 253-383-5433 or contact our customer service department.